So I really need to sit down and come up with a menu for the next week or two so that we can hit the grocery store, because we are really down to the nubbins in the kitchen. I’m talking no eggs, no onions, no butter. It’s pitiful. But somehow whenever I don’t seem to have the ingredients to make anything else, I can always throw together a pasta dish. I suggested as much to Jeremy the other night, and he immediately requested pasta with sausage, vegetables and marinara sauce. After scrounging deep in the bowels of my freezer, I came up with some Italian sausage and spinach, grabbed the last leek from the crisper, and boiled up some pasta. Saute the leek and garlic in the olive oil until softened and fragrant. Add the sausage and brown; pour off any excess fat. Add the crushed tomatoes, sugar and seasoning to taste; simmer uncovered over low heat for at least half an hour. Bring a large pot of salted water to a boil. When you put the water on, add the frozen spinach to the pasta sauce (I use bagged frozen spinach instead of boxed because it is loose, rather than in a giant block) and stir through. 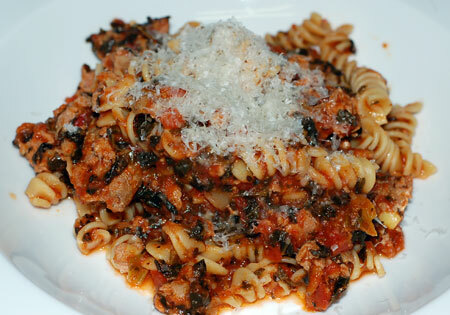 Cook the pasta according to the package directions; when it’s drained and the spinach is cooked in the sauce, combine everything together and eat topped with plenty of Parmesan. Jeremy thought this came out pretty well and scarfed down his plateful. I didn’t care for it at all, perhaps because I’m not altogether a sausage fan (sometimes they are too heavily seasoned for me, and sometimes the texture is suspect); Jeremy happily took care of my plate as well. So I went back in the kitchen and whipped up another plate of pasta for myself, about the easiest and quickest I could manage. This one doesn’t have any measurements, just a general idea. Cook some rotini or egg noodles. While it drains, put the pot back on the stove and melt a couple tablespoons of butter or heat some olive oil. Dump in some fresh breadcrumbs (or frozen, as I did, to no detriments) and some minced garlic and salt. Stir it through and let it brown up just a bit, then add the pasta back in and toss it all together. 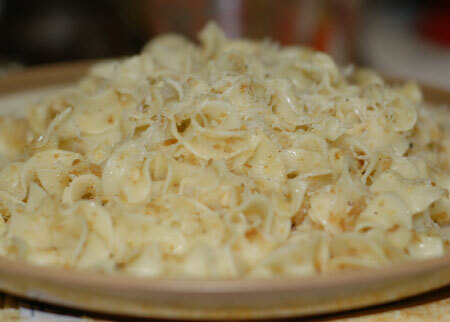 Serve with lots and lots of freshly ground pepper and grated pecorino romano cheese. I love pasta with breadcrumbs.